This Father’s Day, let’s celebrate one of the most beloved dads in animation history -- Bob Parr aka Mr. Incredible. Bob Parr cherishes his days as Mr. Incredible—a popular Super with mega-strength and the power to singlehandedly take out the bad guys. Ever since Supers were outlawed, Bob’s been mostly lying low, raising the family alongside his wife Helen. But when she’s called on to stretch her super skills and hopefully change the public perception of Supers for the better, in Disney-Pixar’s “Incredibles 2,” Bob must manage the household on his own, which calls for a completely different set of super powers. Craig T. Nelson provides the voice of Bob. “I think Bob would’ve preferred to be out there, saving the world, being Mr. Incredible,” he says. “But he accepts his new role and in doing so, he finds out things about his family that I think are intrinsically interesting and important. 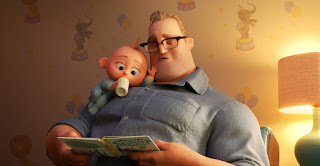 Written and directed by Brad Bird (“Iron Giant,” “The Incredibles,” “Ratatouille”) and produced by John Walker (“The Incredibles,” “Tomorrowland”) and Nicole Grindle (“Sanjay’s Super Team” short, “Toy Story 3” associate producer), Disney•Pixar’s “Incredibles 2” busts into theaters on June 14, 2018.